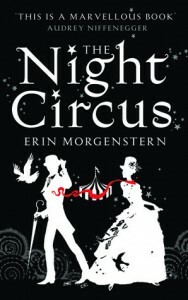 3.5 StarsThe Night Circus is Erin Morgenstern’s debut novel, and it attracted a lot of attention upon its publication in September. A lot of the hype surrounded the idea of magic being not just for children’s books; and early reviews of the book also talked it up a great deal. The Night Circus is certainly an attractive book, at least in the hardback I own even the pages are lined with black and the cover designs are lovely. The story is essentially one of two magicians who are playing a kind of magic game, representing their respective masters. A parallel plot, some years ahead, follows Bailey, a young American boy who becomes enraptured with the circus, in particular a young performer known as Poppet. Morgenstern’s descriptions throughout the novel are wonderful. The circus and all the various spells and locations that the circus visits are vividly bought to life, right down to scents. In addition, the scenes between Celia and Marco are really highly charged with chemistry; meaning that the reader does care about the challenges they face.However, there are some problems with the novel that detracted from me really loving it. Until about the last sixty pages the book is pretty slow. The novel opens with a comparison of Celia and Marco’s childhoods as they train to become magicians, and then follows Celia joining the circus; but there is precious little explanation of the ‘deadly contest’ (until the last part of the novel, when it picks up). Plus, the way the time periods jump about makes following the narrative a little confusing unless you really do make a strong mental note about what year you’re in. There are also numerous parts of the plot that don’t really make that much sense; the various twists in the narrative certainly got a little confusing for me at some points.It is undeniable that Morgenstern in a talented descriptive writer, and as the novel did suddenly become incredible gripping in it’s last part, I will probably keep my eyes peeled for other books by Morgenstern. In addition, I do think The Night Circus would work really well as a film; maybe even better as one-so fingers crossed that it gets a big or small screen transfer.